Tyler Florence does updated comfort food like no one else, but comfort food’s never been updated like this. Join him as he perfects, simplifies, and totally re-invents your favorite dishes in surprising, spectacular ways. Have you ever wondered which cheese, exactly, will make the stretchiest, cheesiest mac and cheese? Or if you can make Hollandaise sauce without fear, a double boiler, or even a whisk? Or if, instead of having to choose between onion rings or French fries, you can make onion rings crusted with French fries? Tyler Florence has. These are the kinds of questions he obsesses over when he thinks about how to make cooking both easier and more exciting. For years, while shuttling between his restaurants and TV shoots, Tyler's kept a notebook of ideas to push his own recipes out of their comfort zone. Now, for the first time in his career, he’s established a culinary lab where he can dive deep into the hows, whys, and why-nots of his cooking. He brings you Inside the Test Kitchen to see his experiments, the wins and the fails, and of course, the delicious, foolproof, and surprising recipes that come out of it. Go from tricks to make basics brilliant—like saucing Double-Creamed Spinach with pureed spinach, or using boiling-hot brine to make a Super-Crisp Roast Chicken— to simpler ways to make the classics, like a nearly no-stir Time Saver Risotto and a Three-Minute Hollandaise, to pure reinvention, like Fronion Rings and almost-instant Modern Burger Buns. Through these 120 recipes, Tyler invites you to question culinary sacred cows, push your skills to the next level, and make food more delicious than they would have thought possible. 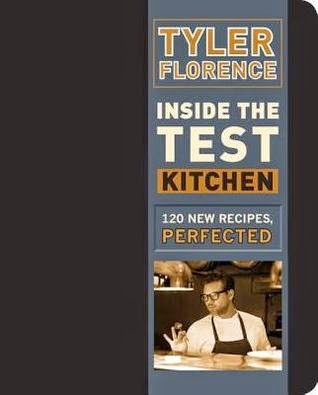 Continuing our "Almost Week of Cookbook Reviews," we have the new Tyler Florence cookbook. Laid out as his personal journal, I loved the look of this cookbook immediately. Inside, you see his own handwriting with jotted notes. On the outside, it includes a great band to keep your book closed or to mark your recipe. The recipes all scream yummy! I will, however, warn you that quite a few seemed a bit advanced for things my children might eat. I do intend on working them up to them though because I can't wait to eat more from this book! If I had one complaint, it's that the pages are standard (though heavy) paper and not glossy so if anything gets on them, they will get stained. There won't be anything preventing absorption. That's one minor complaint though for a cookbook that I'm dying to dive further into.